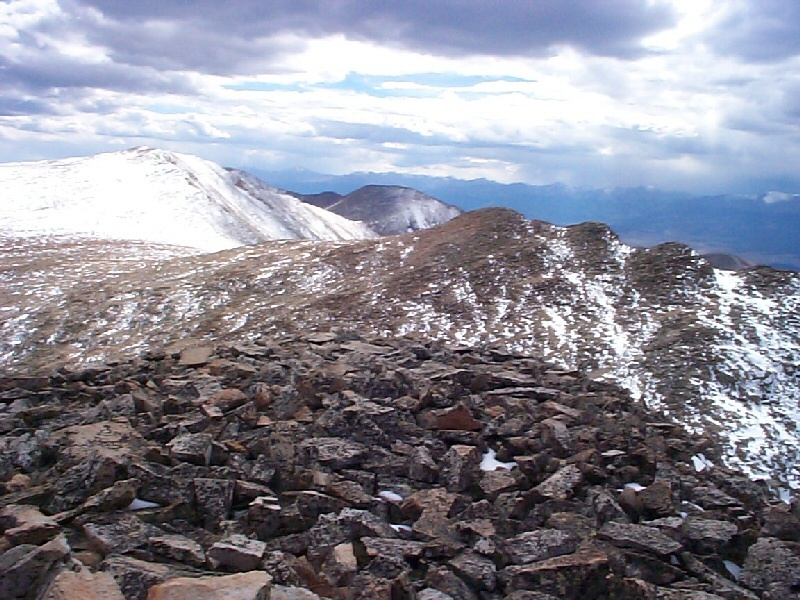 Just east of the town of Leadville, Colorado, lay Mount Sheman as well as several other easily climbable peaks including Mount Sheridan. Although it can be a little tricky finding the correct road, from the historic marker on the south end of town, head east up just about any of the city streets and after 3 blocks, turn right, which will put you on a road which takes you southeast. Continue on this road past some old mining tailings ponds and on towards the historic site of Oro City (about 2 1/2 miles from town). After winding around several drainages and driving several more miles you will need to turn left on a poorly marked gravel road which heads up the hill and into Iowa Gulch. As this road is not marked very well, if you end up at a dead end at the Hellena Mine, retrace your route and the road you seek will be the best maintained road shooting back off to your right. If you don't miss the turn off your total drive from Leadville to where the hike begins will be about 7 3/4 miles. I began the day by ascending an obvious ridge leading from where I parked directly to the ridge just south of Dyer Mountain. This view from the top of the ridge is looking west and shows Turquoise Lake in the distance. From the summit of Dyer Mountain, I had a good view of Gemini Peak (looking east-southeast). In the larger image you can make out in the saddle a blur which is actually a tower for high power transmission lines. The summit of Dyer Mountain (elevation 13,855 feet). Looking west-northwest to the summit of West Dyer Mountain (elevation 13,047 feet) which I did not climb this day. After walking across the saddle seen in the second photo, I arrived on the summit of Gemini Peak (elevation 13,951 feet). I see that I just have to get over there to the big one in the sun - that shouldn't be too hard. My backpack sitting next to one of the many rock structures on the summit of Mount Sherman. Self-portrait of the author on top of Mount Sherman. Yet another rock structure on the summit. A good view of Iowa Gulch from the summit - looking west. My car is down there somewhere in this photo. To get down, I plan to head southwest along this ridge. And then I came across ANOTHER rock structure. Looking back on where I came, you can clearly see the many rock structures on and near the summit. Looking north back into the Iowa Ampitheater you can see Dyer Mountain on the left, and Gemini Peak towards the right. You can also see the saddle which I crossed to get between these two peaks. This photo shows the hill I climbed and the ridge I gained to access Dyer Mountain. This is what Mount Sheridan looks like from a point on the Sherman side above the saddle between Mounts Sherman and Sheridan. From this same location but looking southeast, you can see the Hilltop Mine, the Dauntless Mine, and the many roads providing access up Fourmile Creek. And here is what the White Ridge (elevation 13,684 feet) looks like to the east. Nearing the saddle, will the weather hold? Now that I'm down to the toe of the slope, I'm not as worried about the weather. While in the area, I explored the Continental Chief Mine. Yes - that ridge way up there? I just traversed it. This photo is what it looks like on top. I found some reclamation and waste mitigation going on at this old mine. Another image of the mine. Back at my car, here's a shot of the area of the saddle between Mounts Sherman and Sheridan. And one last shot of the valley below.